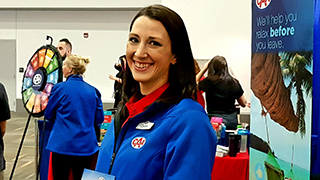 Caitlin Charter, CAA Travel Store Manager, Orleans, ON. Many of the 18,000 attendees stopped by the Newfoundland booths. 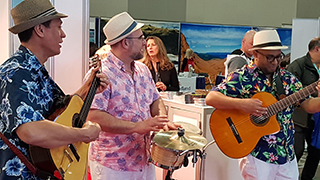 Live music at the Cuban Tourism booth. 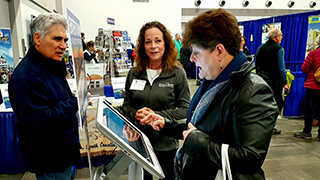 Kimberly Hartley of Myrtle Beach Area Convention and Visitors Bureau (middle) chats with attendees. 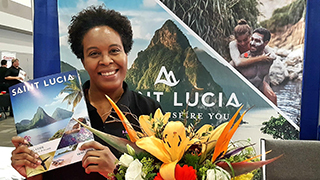 Lana-Andez Lubon, Consumer Marketing Officer, Saint Lucia Tourism Authority. 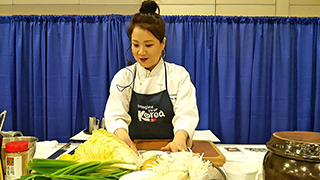 Chef Sunna Na demonstrates making kimchi for the Korea Tourism Organization. 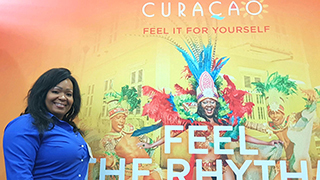 Kadesha Salomé, Sales and Markjeting Assistant, Curacao Tourist Board. Silk fans from China and live Cuban music. Kimchi from Korea and karkade (hibiscus juice) from Egypt. Stetson-shaped stress busters from Texas and folk art from all over. 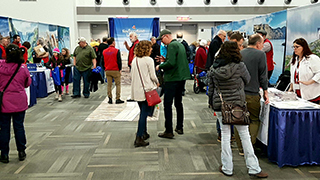 The 200 exhibitors at the 25th annual Ottawa Travel and Vacation Show lured travel enthusiasts any way they could this weekend—but from all accounts, none of those extras was necessary. The show has proven to be wildly successful with consumers and industry alike. Exhibitors were unanimous in praising Ontario’s only consumer show focused exclusively on travel. Kimberly Hartley, Canada Sales Manager for Myrtle Beach Area Convention & Visitors Bureau, was typical. Noting she’s attended at least a dozen times, she said the capital is a unique market. “Government and education workers get guaranteed vacation time, and they take it,” she noted. The capital region is second only to Toronto in funneling Canadians to her South Carolina destination, which boasts 99,000 rooms, a 100-km beach, and a hundred golf courses. There was even an ambassador behind a booth. Balint Odor of Hungary said he attends each year for a short stint, noting that with a rising number of Canadian visitors to his country—46,000 in 2018—it’s important to assure travelers there’s more to Hungary than Budapest, and that Budapest has a lot of little-known treats—from diverse music festivals to Michelin-starred restaurants. 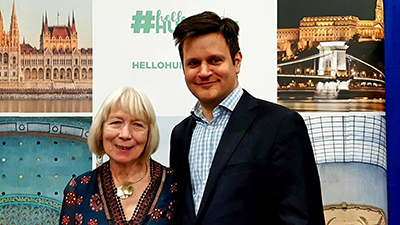 Adds Zsuzsanna Sarmon, Hungarian Tourism’s North American business development officer, there are more than 200 thermal baths, a 240-km cycling path around Lake Balaton, two significant wine regions, and activities from windsurfing to rock climbing. Even for Ottawa’s venerable Handa Travel, in business nearly a half-century, there’s promotion potential. “There are window-shoppers, to be honest,” says group sales specialist Wolf Schwarz, “but many are very interested. This is a chance to show off what we have and hopefully turn interest into sales.” He adds the show allows exhibitors to network with each other, too. This year, Handa struck a deal with a Toronto company to sell small-group tours that Handa originally organized for its own clients. Agencies were given a leg up by the presence of the Travel Industry Council of Ontario. 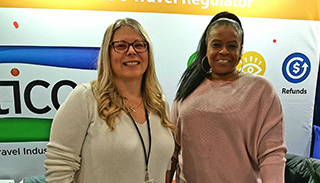 According to Suzie Janko of TICO’s head office, most folks she talked with were unaware of TICO’s compensation fund that protects bookings made by TICO-approved agencies. “The WOW Airlines issue has made people really interested in finding out more,” she said. Other recent travel news had an impact on the show. Co-founder Halina Player noted the loss this year of long-time exhibitors such as Mexico and Turkey because of cutbacks in Canadian operations. But that’s meant space for new ones—Tahiti, Sri Lanka, Martinique, Spain, Galapagos and Honduras among them—and she believes these new destinations helped spike attendance. and Balint Odor, Hungarian Ambassador to Canada. Hurtling down an Olympic bobsled run. Falling off a camel in Rajasthan. Scarfing back 40 butter tarts along the Northumberland Butter Tart Tour. Is there anything Peter Johansen won't do for a travel story? Even so, the retired Carleton University journalism professor hopes his stint as Ottawa correspondent won't pose any danger.